Hi. I’ve just noticed my dog has strange lumps down his throat - like warts or skin tags. I have a photo - is there anyway I can upload these to show you? Assistant: I'll do all I can to help. Some lumps are serious and some aren't. Let's see what the Veterinarian has to say. What is your dog's name and age? Assistant: Is there anything else the Veterinarian should be aware of about Blue? Or are these just normal lumps and bumps found in dogs mouths? Expert: Linda Simon replied 2 months ago. Just a minute while I type my response. Thank you for the photo which is very clear, it can't have been difficult to take that! Given Blue's age and the appearance of these growths, the most likely diagnosis is oral papillomas (or warts). 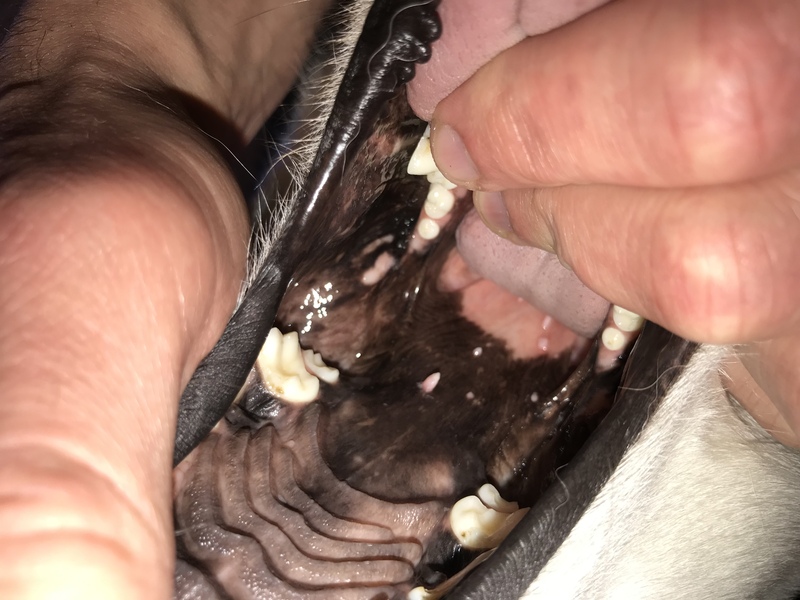 Young dogs tend to get these and while we see them more commonly on the lips we can also seen them on places such as the gums and palate. For most, their immune system deals with them naturally over the course of a few weeks to months and they will gradually disappear. We would only tend to remove papillomas if they were causing issues with eating or becoming infected or irritated, but these small growths should not cause any issues. Of course, the only way to know for sure what any lump or growth is would be to sample the cells (either by popping a needle in, taking a biopsy or removing the growth) in a laboratory. As the growths are in an awkward position, this would either require deep sedation or anaesthetic. If he were my dog, I would be inclined to take the 'wait and see' approach. The growths should go away over time and if they do not or if they are growing, we would alter the plan. Thank you so much for your help. You’ve put our minds at ease now!